January 9, 2009 -- Nestled near the back of the original East Hall of Chicago's McCormick Place during the 2008 RSNA show, newcomer Alioscopy seemed content demonstrating its 3D technology products and services to a steady stream of professional attendees. For Philippe Roche, CEO of the San Diego-based company, Alioscopy's appearance represented a formal coming-out exercise designed to test the healthcare industry's reception of the firm's 3D high-definition autostereoscopic LCD and content creation products. The company hopes that its autostereoscopy technology -- which produces depth perception even though displayed on flat 2D monitors -- will create a new standard for 3D imaging. What makes the technology so appealing to other industries that have seen it, such as the media-rendering and movie business where DreamWorks and Lucasfilm have shown an interest, is that it doesn't require 3D glasses, according to Roche. Another key point stressed by Roche is that Alioscopy's autostereoscopic 3D visualization and display technology creates images originally in 3D. "We offer full 3D imaging," he said. "We don't start with a 2D image and convert it to 3D." Alioscopy's 3D autostereoscopy technology is designed to create the illusion of depth perception, without the use of special glasses. Image courtesy of Alioscopy. Although Alioscopy's technology initially wasn't created for the healthcare industry, Roche admitted the firm was intrigued by its potential, seeing as how CT and MRI units were already venturing into 3D territory. Consequently, the medical market seemed like a worthwhile prospect, particularly for the value Alioscopy's products could bring. "[Healthcare organizations] are starting to be aware of 3D and its value," he indicated. Alioscopy launched in February 2008 and exhibited at a few trade shows last winter and spring, garnering an award for its technology at one of the shows. That's when the company decided to participate in radiology's showcase conference. "We thought, 'Why not?' " Roche said. "We didn't come here to sell anything, but just to talk about what our technology can do and how it can be applied in healthcare." That includes diagnostic and educational aids, as well as patient understanding. In fact, the 3D high-definition images moving and rotating on twin, large flat-screen LCDs did turn heads. And Roche insisted that the "immersive and visually compelling" images the Alioscopy technology produced -- from cellular models to fully animated 3D surgeries and chemotherapy procedures -- could be viewed on 3D-enabled iPhones, too. 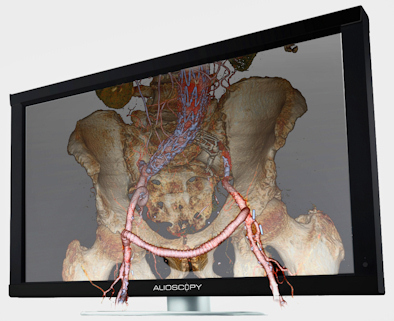 Alioscopy has been developing its 3D high-definition display product for 14 years. It features a highly specialized lenticular lens that produces high image quality, clarity, and depth. Alioscopy's displays are available in a 24-inch portable monitor and a 40-inch LCD monitor that can show content in two, four, or eight views. Using open architecture, the 3D high-definition display can show standard video and develop and render 3D content with off-the-shelf 3D software applications such as Autodesk 3ds Max, Autodesk Maya, Softimage XSI, Maxon Cinema 4D, and NewTek LightWave 3D. Alioscopy also equipped the technology with real-time capabilities so that viewers can interact with the content as if moving through a video game. Scripts and plug-ins, along with proprietary mixing software, allow end users to connect with proprietary visualization and 3D software. The plug-in takes any image or animation and generates eight multiple-rendered views for output to the Alioscopy monitors, according to Roche. He is quick to clarify that Alioscopy is not in the holography business, nor does his company make products that create holograms, which involves different technology, he said. While Roche doesn't see too much of a cost differential between 2D and 3D technologies -- at best an estimated 10% to 20% -- and even less between standard 3D and autostereoscopic 3D, he also doesn't expect intense demand from hospitals and other healthcare facilities, regardless of the economy. That's not part of Alioscopy's strategy anyway. "We want to focus on R&D and enter into partnerships with other manufacturers," he said. "We're looking for partners to incorporate our technology into their products." As an example, Alioscopy built a prototype endoscopic 3D camera and is in discussions with a prominent, but unnamed, manufacturer to incorporate the product into its technology, Roche said. Roche remains optimistic about 3D's prospects and Alioscopy's role in 2009. In fact, he told AuntMinnie.com that 2009 represents "the year of 3D displays and signage." He also said he anticipates glasses-free 3D imaging standards to be released this year.